The Office of Management and Budget announced a new policy last Friday that effectively bars Federal agencies and departments from buying the laptops or desktops of their choice. 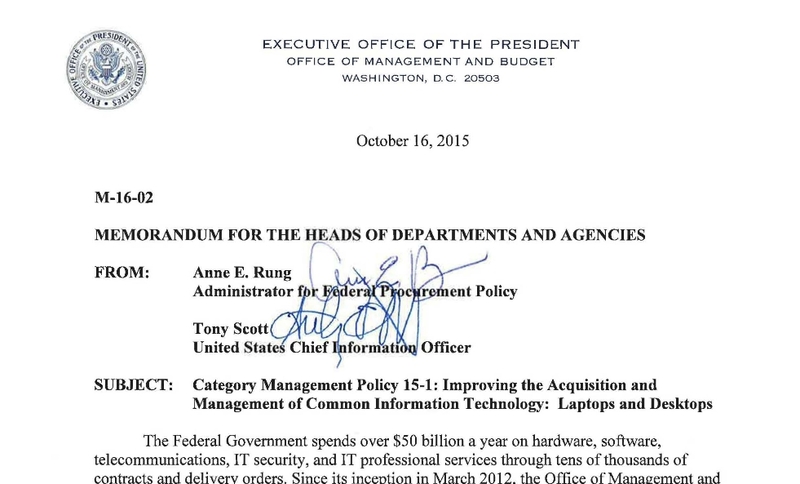 In an Oct. 16 memo to all federal agency and department heads, U.S. Chief IInformation Officer Tony Scott and Office of Federal Procurement Policy Administrator Anne Rung put a halt to what they characterized as disjointed and inefficient desktop and laptop acquisition practices within federal agencies. The new policy guidance is aimed at enhancing the government’s buying power by reducing the number of contracts agencies can use for commodity IT purchases and standardizing desktop and laptop configurations. The memo directs all civilian agencies to stop managing the purchase of their own laptops and desktops, requiring them, instead, to purchase through existing “best value” governmentwide contracts. These contracts include: NASA Solutions for Enterprise-Wide Procurement (SEWP); General Services Administration (GSA) IT Schedule 70; and the Department of Health and Human Services (HHS), National Institutes of Health (NIH), NITAAC Chief lnformation Officer Commodities and Solutions (CIO-CS). In addition, the Federal government will determine the attributes and allowable upgrades agencies may purchase, in an effort to standardize computer usage across all agencies, the memo said. Variations in these attributes will require OMB approval. An interagency working group of computer experts will work with agency CIOs and the vendor community to identify the attributes of standard or upgraded laptops and desktops every six months beginning in the fourth quarter of fiscal year 2015, the memo said. Opinions differ among federal acquisition experts as to whether or not the new policy will have a measurable, positive impact. Larry Allen, founder of Allen Federal Business Partners and the former President of the Coalition for Government Procurement, said the new guidance is well-intentioned but lacks an enforcement mechanism. “This has been a historical problem with OFPP. They can direct, cajole and encourage agencies to take certain steps in acqusition, but they have no ‘foot soldiers’ for enforcement,” Allen told MeriTalk. But one acquisition analyst, who spoke to MeriTalk on condition of anonymity, questioned the timing of the policy guidance, arguing that it is unlikley to have an impact so late in the life of the Obama administration.